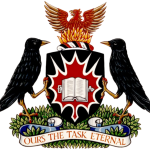 Established in 2008, Archives and Research Collections (ARC) has dedicated itself to learning and research at Carleton University. Located on the 5th floor of the MacOdrum Library, the collection includes rare books and materials on a wide range of subjects from as early as the fourteenth century to 1800. Thanks to the department head, Chris Trainor and the Archives and Rare Book Coordinator, Lloyd Keane, the Medieval Ottawa team was given the wonderful opportunity to research these medieval materials and ultimately digitize and display them to share their beauty with the public. The Carleton University Art Gallery (CUAG), since its establishment in 1992, has served as a cultural hub for the university and the larger Ottawa community. The beautiful folia held in this collection range from the 14th – 15th century and feature some of the most highly illuminate pieces featured in our exhibition. Thanks to Patrick Lacasse, Collections & Exhibition Assistant, we were able access these works for research and display them in an attractive and safe manner to ensure the preservation of these rare items.